In Brief: The results are in for the In the Library with the Lead Pipe reader poll. Detailed results and sample responses for each question are provided. Additionally, the article lists actions the editors will be taking based on the results. Back in April we ran a reader poll asking some questions about our content and future directions. We’ve gone through the responses and wanted to report back on our findings. First, some background. In the month of April 2012 we had 5,385 unique visitors with 1,883 of those being returning visitors. We currently have 5,409 RSS feed subscribers. We also have 5 Kindle subscribers.1 Based on the average visit duration2 we’d say it’s safe to say most visitors of the site don’t read every article in full, but instead are checking in to see if the current article interests them. To that end, and based on some of the comments discussed later in this article, we’ve added a new “In Brief” section to the beginning of each article to help with those decisions. The reader poll received 189 responses. It is difficult to come up with an accurate number of readers of In the Library with the Lead Pipe, but those 189 responses are roughly 10% of the number of returning visitors and roughly 3.5% of the unique visitors for that month. This was obviously a convenience sample rather than representative sample so join us in adding several grains of salt to the following summary of results. The majority of respondents identify as academic librarians. While we strive to be relevant across a broad swath of librarianship, we are aware that our founders came primarily from the academic environment and this affects the topics we select. Moving forward, we hope to expand our authorship to be more inclusive of a wider diversity of issues in librarianship. Some of the areas in which we know we would like to improve include areas of librarianship such as: cataloging, special collections, archives, medical libraries, school libraries, prison libraries, international libraries, and LIS educators. (This list is not exhaustive.) We would also love to include a wider variety of voices from underrepresented and marginalized communities. And readers, if you know an awesome writer or have a suggestion on ways to diversify, please share! Several ways to get in contact with us are at the end of this article. 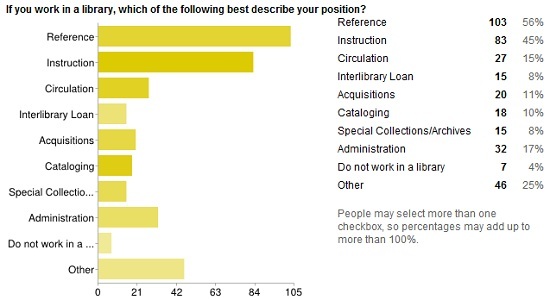 Within academic librarianship, most of the respondents identified as reference and/or instruction librarians. The majority selected more than one category. 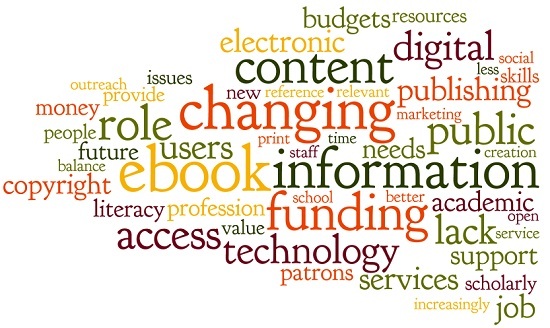 Many chose to write in additional position descriptions such as: all of the above, assessment, clinical librarian, collection development, eresources, government documents, learning commons, liaison, outreach, program coordinator, systems, tech trainer, and youth services. Several checked “other” without adding text. The vast majority of respondents follow In the Library with the Lead Pipe via RSS. This was a bit surprising to some of the editors due to our current immersion in a social media-heavy environment and the popularity of Twitter among librarians. For comparison, we have 5,409 RSS feed subscribers, our Facebook page has 616 likes, we have 2,711 Twitter followers and we are in 65 circles on G+. We realize that we had only been using social media as a way to alert readers about new articles. We are making a greater effort to be more participatory in those spaces. In the Library with the Lead Pipe began by representing itself as a blog. However, behind the scenes the editors have been discussing what about our current incarnation separates us from an open access journal. We’ve had an ISSN since we started and are indexed in Ulrich’s and LISTA. Readers may or may not have noticed that we’ve altered some of our language. For example, we now refer to our published “articles” rather than “posts.” We take a lot of pride in the articles we publish and in our peer review process. Although we started as a scholarly blog, we quickly realized that our open peer review process was a unique and robust experience for all involved. A typical article published here grows throughout the review process thanks to reviewers’ comments, conversations with the author, and even conversations back and forth between reviewers. Frequently peer reviewers will engage with one another in conversation about ideas presented in an article. Sometimes reviewers agree, other times they don’t. We feel that this rich peer review process sets us apart from scholarly blogs and puts us in the realm of “journal.” Several comments also suggested that we should be more transparent in our peer review process and let our readership know more about what goes on behind the scenes. This article is part of that effort and we’ll also be sharing some of our process documents soon (see the section Areas for Growth below). We are also very interested in debates around publishing and tenure. Does a journal need to have volume and issue numbers? Do articles need to be published in batches? Can well-researched, peer-reviewed articles be used for tenure portfolios if they were published on a blog? We’re excited to explore the boundaries around these issues. This section had 134 replies. The top five codes were: quality (includes ideas like depth, breadth, well researched) (72), diversity (36), point of view (27), topics (22), and relevancy (18). The overarching theme in this section was quality. Comments about the depth, breadth and level of research were common as well as the diversity of topics, authors, and viewpoints. Excellent writing! In depth, pertinent, thought provoking, insightful. Thank you. Fresh voices from across the library profession, peer reviewed posts, and strong, clear writing. Ideas and insights from all types of libraries. I enjoy the freedom to speak in a professional atmosphere and reading authoritative articles. It is earnest and thorough and appropriately documented. I often find myself reading articles on stuff I thought I didn’t care about. Lead Pipe is smart, current, and not pretentious. So many library journal articles seem to come out of a publish-or-perish culture at many of the larger academic libraries. Sometimes I feel that we have so much literature, but none of it is really saying anything. I really appreciate that the Lead Pipers always seem genuine. You go deeper into issues; it’s the NPR of my library news channels. (I mean this in the best of ways). When I first started reading Lead Pipe, I thought of it as a “blog with the perfect number of posts.” I *love* the regular schedule of publication–I am always interested in the content, and considering the length and depth of every publication, I really appreciate that I have two weeks to read the latest post before a new one comes out. This section had 99 replies. The top five codes were: more (23), shorter (22), none (e.g. “Can’t think of anything” or “You’re doing great”) (20), more authors (13), transparency issues (7). The length of the articles at In the Library with the Lead Pipe was a recurring theme throughout the comments. In the previous question there were comments specifically praising the length (12/134). The pro-length contingent was outnumbered by the requests for shorter articles (22/99), however, the majority of people who made a comment relating to more or shorter articles added a qualifier. For example, they’d like some shorter pieces interspersed with the longer ones, or longer pieces in installments. At this point we are pretty tied to our long form article format, but there were several interesting suggestions in those qualifiers that we’ll be mulling over such as breaking longer pieces into installments. If you have additional thoughts on this issue (or any other ones brought up in this article) please leave a comment below. Compiling a dynamic index of peer reviewers to thank and publicize the individuals who have kindly dedicated their time and expertise to make the In the Library with the Lead Pipe a success. Adding a note to the front page explaining that our publishing schedule is every other Wednesday. Revisiting previous articles that lack guest author introductions and adding them retroactively. Moving forward, we hope to expand our authorship to be more inclusive of a wider diversity of issues in librarianship. Hmmm. More of course. But the lengthy articles are hard to produce and come by. Perhaps shorter pieces or compilation pieces interspersed between the longer pieces. Or posts that insightfully introduce a topic and let the discussion follow? I really can’t think of anything, except maybe increasing the frequency (which I admit would be hard to do without sacrificing the quality). I’m ashamed to say I would appreciate some short posts. You are smart folks, and I’m guessing sometimes you have things to say that aren’t as big or long. That might generate more comments and more conversation as well. So perhaps it could be like an editor’s commentary that isn’t peer-reviewed? It’s often a bit long and intimidating (compared to other RSS stuff). Perhaps a short synopsis at the top, then the full article with citations etc? More. I know you’re all very busy, but this is one of my favorite library related blogs. i just wish there were more updates, more frequently, more authors (?). The thing I like most about Lead Pipe is unfortunately the thing that hinders it from doing something that I think might make it better. I’d love if there could be a more frequent posting schedule, if only because the writing is so thought-provoking. However, I can only imagine the work that goes into these articles, and if posts were to come on a weekly basis, I might wonder if they were as high quality as the posts that came once or twice a month. Your model fills a unique niche. More content would be better but not at the risk of diluting the quality. We’ll be sure to mine this list for future article ideas. As a reminder, we are always seeking guest authors, especially those whose voices or perspectives are under-represented in our professional dialogue. Read how to contribute on our submission guidelines page. I always love posts on instruction and information literacy, but I understand that topic often takes over (just look at the tag cloud!). I’d be interesting in reading about profiles of interesting libraries, ones that have unique services or job roles for librarians that could/should be replicated at other libraries. I also like the idea of posts that find inspiration from outside libraryland. More on Service Assessment and measuring value, please! I’d be interested in detailed real-life library scenarios with panel interpretations on how best to handle it and feedback on the policies and principles that come into play…maybe one case each month? Comparison/Contrast of library resources. What are the major options today? how to they compare to one another? what is the strength/weakness of each? Some ideas on what to compare: Article databases, eBook resources, ILS, CMS, etc. I’m biased- but in the library world in general I wish there was more support for Library Para-professionals and also help in making the transition from a para-pro to Librarian. There is such a weird divide in the library world and I feel it is really unfortunate. Library worklife. Unions. Salaries. Unemployment. The redefinition of what libraries are. How they can help with the digital divide. How they can advocate for their communities. The most pressing issue is that librarians need to become clearer about what it is that librarianship is about, and then confidently do it. We have allowed ourselves to be told we don’t matter any more. Nothing could be further from the truth. The economic crisis and technological advancements, one keeps us from affording the other. The changing landscape of publishing and formats (yes, e-books are important). The potential evolution of the public library into a space for learning and culture as opposed to a more repository/collections-focused role. Decreasing government support for public libraries and a corresponding increase in private and corporate funding, and what this says about the public sphere. Staying fresh when you’ve been in the environment for a decade. Figuring out when to adopt a new technology or try and when to take a pass, timing of technology adoption. The future of copyright and our role in moving change forward. We’ve been working through the process of registering as a nonprofit in order to support cool library projects. Registration costs money (about $1,000) and so does support for library initiatives, so it would be useful to generate some income and one way to do that would be to accept advertisements. We’re proud of our editorial independence and would never do anything to sacrifice it, or even call it into question. Would accepting advertisements from companies that aren’t associated with libraries cause you to think less of us? What about a donation button? Respondents expressed overwhelming support (92/116) for a donation button (with only 3 comments against) as well as broad general support for advertising (49 unqualified for, 29 for with qualifiers, and 25 against). These results prompted further discussion amongst the editors. While the numbers alone would point towards allowing advertising, we felt there was enough concern both from comments in the poll and from our own reservations that we have decided not to pursue advertising. We are looking into implementing a donation button, but still need to work out the logistics for that. There was also a call for transparency in wanting to know what we’re hoping to accomplish as a nonprofit. In the Library with the Lead Pipe is a labor of love for all involved. We have been lucky enough to use donated server space from ibiblio. But as we seek to grow our reach (see the mention of supporting cool library projects above), we will incur costs. 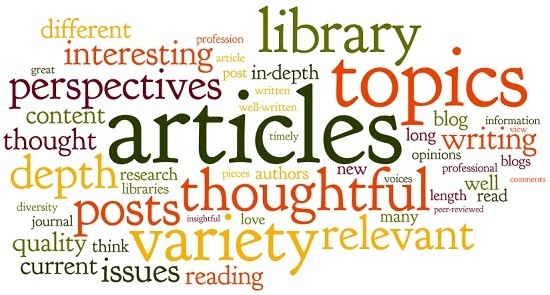 As we say on our about page, “In the Library with the Lead Pipe is intended to help improve our communities, our libraries, and our professional organizations.” Publishing articles is one way of doing that, and we’ve focused on this for the past four years. However, for the last year or so, we’ve also been discussing other, complementary ways of accomplishing this goal. We have several ideas of types of projects and events that we’d like to fund, but are still debating which one(s) we feel are most feasible both in terms of funding and in terms of our schedules. We hope to share more in October. The last section asked “What else would you like to tell us?” And the responses warmed our hearts. Out of the 49 responses, 41 were some form of praise with the remainder being comments on the blog v. journal issue, jokes, or sharing their love for RSS. I just wanted to say thank you. I don’t know that I’ve ever commented on any posts and sometimes when there aren’t many comments, you must think “gee, does anybody care?” I know how much work maintaining an operation like this must be, particularly after the honeymoon phase. Please keep going! I like a blog that doesn’t shy away from long essays. So many places seem to feel apologetic if they write a long post, which just strikes me as silly. There are no RULES about the length of a post in a blog; only the criteria of the author(s) for the achievement of their goals. The blog format is not typically quite as lengthy or verbose as most “Lead Pipe” posts. When I’m reading RSS feeds (which is where Lead Pipe delivers), I generally give a max of about 5 minutes attention to any post. I’ve saved many Lead Pipe for weeks, repeatedly hitting “keep as new”, before eventually giving up and not reading them unless they’re written by someone I know personally or on a topic close to me. Keep up the good work – I really enjoy your posts, and even when I don’t have time to read them, I bookmark them to read later. thanks for giving readers the opportunity to speak their minds. This is an amazing blog. Please keep up the good work. Reader feedback will only take you so far. Studies have proven that people in feedback surveys don’t always articulate or properly address the issues that really concern them. So, take all these answers with a grain of skepticism. But not mine. This is an absolutely amazing project. Great job and thank you!! Thanks so much for taking the time to share your feedback with us. The results confirmed some of our hunches (audience composition, preference for variety) and gave us some great ideas for the future (see the entire “areas for growth” and “topics” sections). Please feel free to leave additional feedback here, or anytime on Twitter, Facebook, or Google+. If you’re interested in writing for us, see our submission guidelines. Thank you to Pete Bromberg, Erin Dorney, and Emily Ford for their incredibly helpful critiques of this article and to all of the In the Library with the Lead Pipe editors for reviewing the survey results and taking action. Special thanks to Brett Bonfield for last minute code wrangling. On the question of ‘blog vs journal’, I’m interested in your comments about your robust peer review process — which I think sounds like is NOT a “double blind” peer review process, it’s an open process where neither the reviewer nor the author is anonymous to each other. But we still occasionally get people saying “My tenure process won’t pay attention unless it’s blinded peer review.” (My answer is basically, sorry, that’s your institution’s problem). I wonder if you’ll run into that too. Would be interesting for we less-traditional non-blinded peer review publications, especially both in the library sector, to compare notes. On the RSS issue: You have noted most of your readers are RSS readers. You also note you added an ‘in brief’ to the top of each article. If possible, you might consider offering an RSS feed that’s _only_ of the ‘in briefs’. Your RSS feed now contains entire article text, and your articles get LONG. A feed of just the ‘in briefs’ (where the feed links were still to the full articles) would let peopel see in briefs and decide to click through. I’m also the ‘editor’ of the planet.code4lib.org feed aggregator. About a month ago I added your feed to that aggregator (I love your content). That may or may not have resulted in a spike of feed-reading-audience, depending on how your statistics are gathered. But a ‘brief only’ RSS feed would be useful there; as it is now, the articles are so long they make it hard to read the rest of the feed (but I leave em there anyway cause I love what you’re doing and want to advertise it). You are correct that our peer review is not “double blind.” I actually only just recently found out that it is common practice (in the sciences at least) for authors to suggest appropriate reviewers for their pieces. So we do have that in common. We ask the authors to arrange to work with one of the Lead Pipe editors and an external (as in a non Lead Pipe editor) reviewer who has experience with their topic. We also offer to help with suggestions and connections if needed. The most common format for reviews is a Google doc (though we don’t require it), so all of the reviewers’ and authors’ comments are on the same document and they can converse with each other as well as with the author. I think these dialogues are incredibly valuable. As far as I can remember, none of our authors (or potential authors) have specifically discussed the tenure process as a reason for wanting or not wanting to write for us. But I wouldn’t be surprised to find out that some busy people passed us by because we wouldn’t be considered in their portfolio. Hence the line in the article about our interest in exploring boundaries. We’ll look into the separate ‘in brief’ feed. I know we’re looking into a site redesign as well, so I’ll add that to our list of desired features. I personally hate all feeds that make me click through for content and almost always immediately unsubscribe when I realize that’s how they’re set up, so I hadn’t looked past my own biases on that one. And thanks for including us in your aggregator! I don’t follow our stats very closely so one of the other editors may be able to comment if they saw a spike. It’s probably worth adding that our peer review process was inspired by the Code4Lib Journal. And also that I’m a big fan of Jonathan’s writing. Thanks for including us in planet.code4lib.org. I feel the same way Ellie does about feeds that require me to click through for the full text. Echoing Ellie, it’s good to read a persuasive argument that forces me to look past my biases. yeah, I wouldn’t suggest you should ONLY offer a feed that requires you to click through for full text. (some people do that when they want to force users to come to the original website to read the content, not anyone’s goal here). But when the articles are as LONG as as yours, I think a feed of just ‘briefs’ with click through to fulltext might be a useful alternative. Depending on how your feed reader works, those very long articles can disrupt the reading the experience for everything else. I REALLY like what you’re doing, you’re getting a kind of content, intelligently written, long-form thoughtful essays that are based on facts and evidence but not afraid to draw a rhetorical line of argument and take a stand — that for whatever reason Code4Lib journal is not getting (even on technical issues). I’m curious how you’ve managed to get this great content, not necesarily because I want to copy it at Code4Lib journal (I think we’re both occupying different useful niches at this point), but just cause I’m curious how you managed to be so succesful here. Also interested in how many articles you turn down — you don’t publish any stinkers, not sure if that’s becuase you’re turning lots of articles down or only attracting the right folks or what. In some ways, I think it might actually be to your benefit that you don’t look like “a journal” — I think C4LJ, by “looking like a journal” ends up attracting submissions that are actually of _poorer_ quality, that we need to weed out (sometimes controversially). It would take a longer post to explain why I think this is so, but think of all of the terrible boilerplate “1. Literature Review. 2. Findings 3. Conclusion” articles you see in “real journals”, that don’t actually have anything valuable to add to the discourse. I would say there are two main ways we get our content. 1) We write it. The majority of the editors (myself excluded) are in the regular writing rotation. 2) We recruit it. Most of our guest authors were approached by one of us to write for us as opposed to submissions (which we actually get very few of – but would be happy to get more of – hence the call in this piece). We’ve actually turned down very few articles, but again, we’ve had very few unsolicited submissions. I think the recruitment allows us to approach people we are already impressed by and does help with quality, but it also hurts us in terms of getting a broader diversity of voices since we are limited by who we come into contact with (again, hence the call in this piece). I’ve never felt more a part of the broader library community than seeing some of my comments relayed here. Thank you again for letting my input matter a little. Many times has this blog renewed my faltering interest in librarianship.